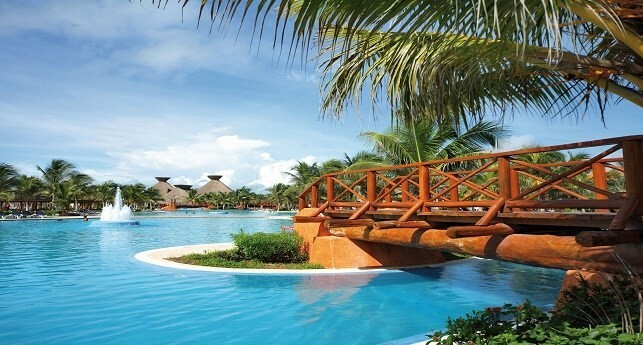 The resort Barceló Maya Beach Resort All Inclusive of 5 stars comprises 5 hotels. A la carte dinner at the specialty restaurants: Rodizzio Brazilian Cuisine, Brasserie French Cuisine, Caribe Caribbean Cuisine (Subject to availability). Lunch, snacks and beverages available at Cora Grill. Sports: tennis (lit courts, equipment included additional fee applies for night lighting), snorkeling (1 hour free equipment use per day/deposit required), kayaking, windsurfing (standard boards only), sailing (standard boats only), diving (1 lesson free per week in swimming pool), catamaran, aquatic bikes, aqua-aerobics in pool, water polo, beach volleyball, table tennis, darts, giant chess set, and a billiards table. * Taxes and gratuities included. * Access to the sister hotels Barceló Maya Beach & Caribe and Barceló Maya Colonial & Tropical. Important information: A La Carte dinners are limited to one dinner per night reservations and dress code required. All reservations are subject to availability, Dress code: formal Long pants, collared shirt and shoes are required. 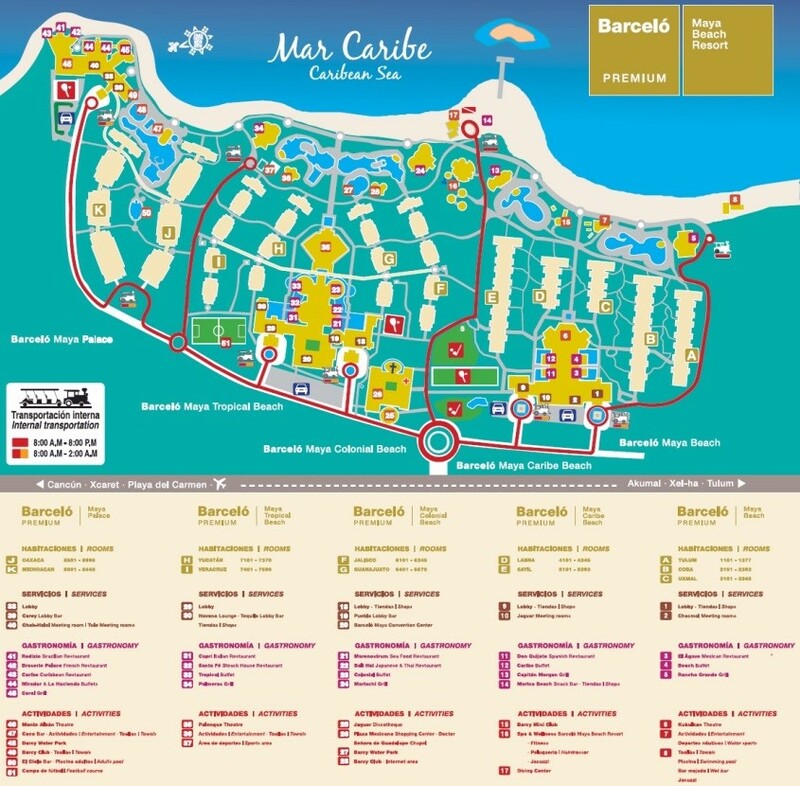 Guests staying at Barceló Maya Palace Deluxe will have access to all of the buffet restaurants, bars, beach and pool facilities of the Barceló Maya Beach, Barceló Maya Caribe, Barceló Maya Colonial and Barceló Maya Tropical hotels. · One a-la-carte dinner per night. The hotel will indicate the restaurants you can enjoy. Bookings are subject to availability. ** For stays of 4 nights or more. You are welcome to book online thru the link above. DO NOT WAIT TO BOOK! The wedding is coming up soon and it will sell out! The Barcelo Maya Palace is the most exclusive of the resorts on the Barcelo Compound. If you stay at one of the other resort properties you will not be able to visit or have exchange privileges the host resort. You will find the club premium details listed above. Please note there is a transfer service that will offer you great service and pricing. Hello my name is Wendi Montoya. I am so excited to be working with Kevin & Kelley on their wonderful Destination Wedding. I have had the pleasure of planning Destination Weddings for couples for over 10 years. The couple has chosen the beautiful Barcelo Maya Palace. Please find resort information on this page and use the link listed if you are interested in booking your own room and still get benefits of booking within this group. I look forward to helping all of the guests find the room categories and dates that best fit their travel needs. I will need your flight arrival and departure information to ensure your Airport Transfers are setup and waiting for you when you arrive Cancun, Mexico. You will need to fill out a Credit Card Authorization form on file to have your travel documents sent out. Please click this link for your options. The final payment will be due 45 days prior to departure. This is subject to change. At the time of deposit you can request your final be made to the same credit card on the Final Balance Due Date. I am happy to work with anyone needing a monthly payment plan. Make your initial deposit. When ready to make a payment, email the amount you would like to charge and the last 4 digits of the credit card you would like to use. If you are using a different card then what you used for the deposit then contact me to set it up.